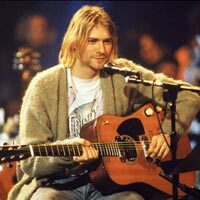 Kurt Cobain is remembered as one of the most iconic rock musicians in the history of alternative music. He is still recognized as a great guitarist and singer/songwriter and in 2006 took over from Elvis Presley as the top earning deceased celebrity. Like two of his uncles before him, Kurt Cobain committed suicide in 1994 with a bullet to the head. With that single action he joined the 27 Club and other members Janis Joplin, Jimi Hendrix and Jim Morrison of the Doors; great musicians who all died at 27 years old. Kurt Cobain was the founder, lead singer, songwriter for the grunge pop group, Nirvana – the flagship band of Generation X.